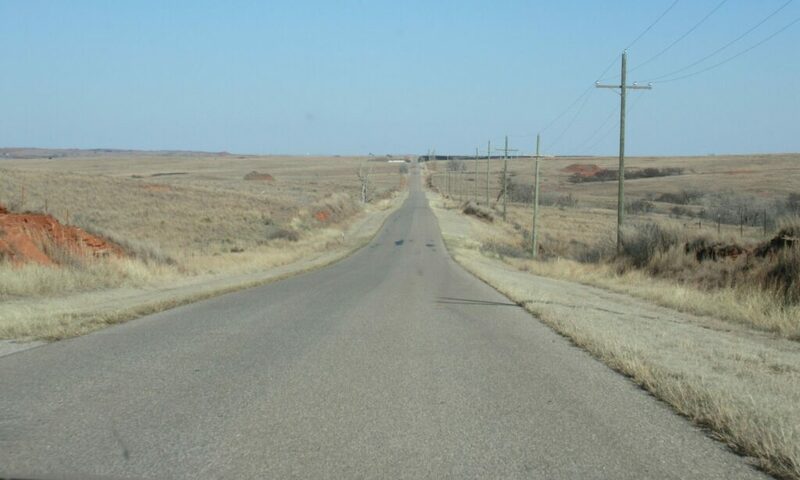 We continued to follow the old Route 66, much of which now runs along Interstate 40 in this area. We went to Amarillo, Texas, where Cynthia visited Amarillo Museum of Art (#6) (www.Amarilloart.org) while Larry searched in vain for car wash large enough to clean off the accumulated mud spray on both the trailer and car. 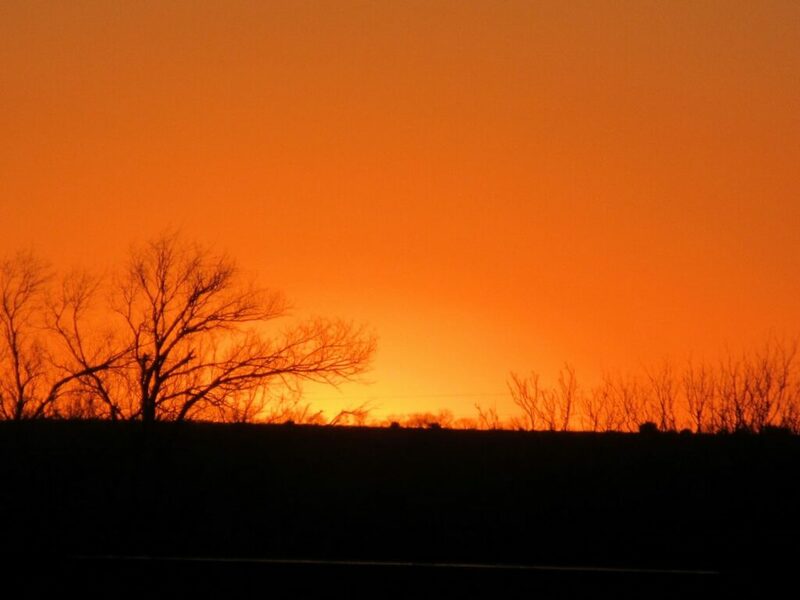 We aimed to stay the Palo Duro State Park, which the Texans boast has the second largest Canyon in the United States, after the Grand Canyon. However, it was full, as this was spring break in Texas. We were able to stay next door at a Zipline outfit that also had RV hookups on a bluff overlooking the canyon. 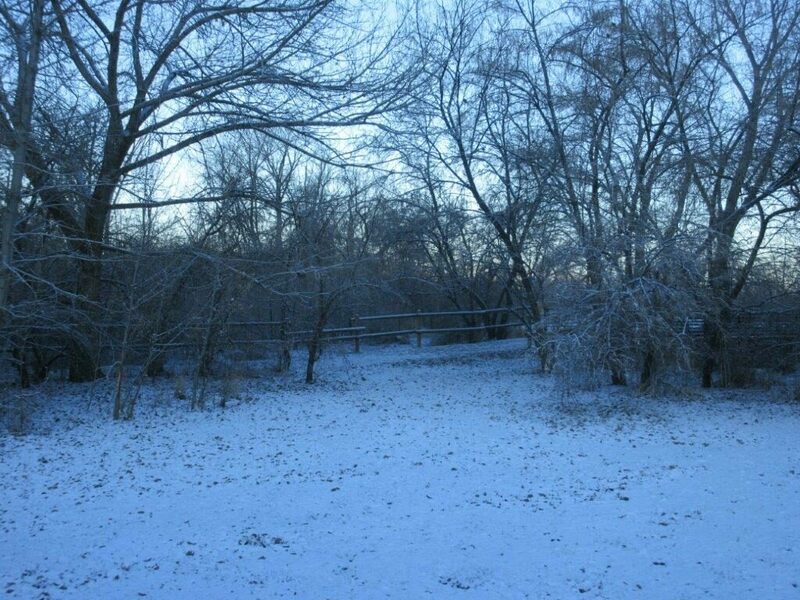 We finally reached the point that the overnight lows were staying above freezing, so we could put water in our fresh water tank and simply turn on the taps when we needed to. We stopped in the city of Panhandle, Texas to see the little “Square House Museum,” (#7) (www.squarehousemusum.org) which was sort of a local county history museum with a very talkative and helpful local volunteer. We then entered Oklahoma (the first time there for both of us) and made a stop at the Washita National Battlefield, where General Custer managed to stir up Indian hostilities by a night-time raid on a Cheyenne encampment. We stayed at a state park at Foss Lake and enjoyed warmer weather that allowed us to read outside and enjoy the laughter of kids enjoying their school’s spring break and trying their hand at fishing in the lake. We then entered Oklahoma (the first time there for both of us) and made a stop at the Washita National Battlefield, where General Custer managed to stir up Indian hostilities by a night-time raid on a Cheyenne encampment. We stayed at a state park at Foss Lake and enjoyed warmer weather that allowed us to read outside and enjoy the laughter of kids enjoying their school’s spring break and trying their hand at fishing in the lake. 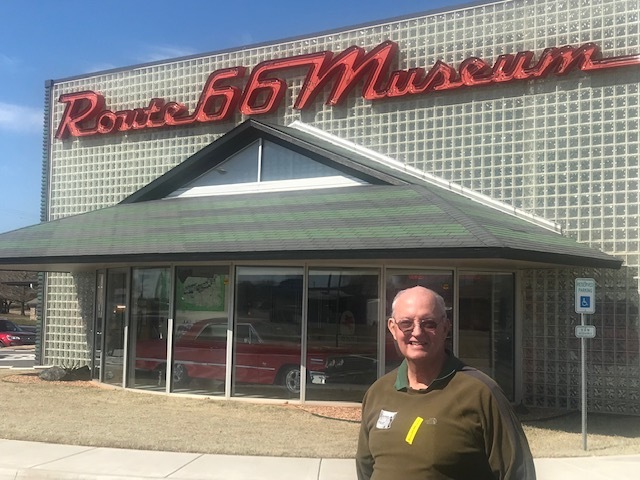 We started the day on Tuesday, March 19 by touring the Route 66 Museum in Clinton, AR, full of information about this historic highway from Chicago to Los Angeles. Then we headed west to Tulsa, stopping at the Chisholm Trail Museum (#8) (www.chisholmtrailmuseum.org) in Kingfisher and the Oklahoma Territorial Museum (#9) (www.okterritorialmuseum.org) in Guthrie. In Tulsa we took a break from the trailer and stayed at Candlewood suites hotel for two nights. That gave Cynthia a chance for a full tour of the Philbrook Museum, (#10) (www.philbrook.org) while Larry stayed at the hotel to take care of some administrative work and do a couple loads of laundry. We enjoyed a nice steak dinner out, so no need to cook or wash dishes. We love venturing into Utah and the red rock canyons carved by the Green, Colorado, Virgin and other rivers of the Southwest. 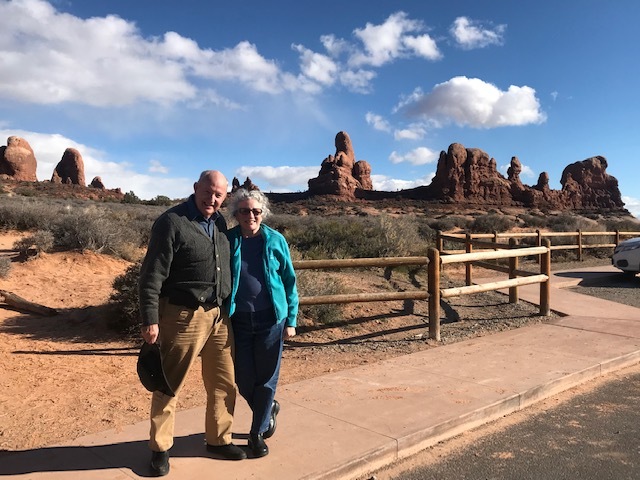 On March 14, we went southeasterly in Utah to Moab and Arches National Park. This requires going over 7500- foot Soldier Summit and down the narrow Price River Canyon. A delightful find was the Railroad and Mining Museum (#2) in Helper, Utah. The coal mines in this area shipped their coal out by rail and extra “helper” engines were needed to get trains over the pass, thus the name of the town. 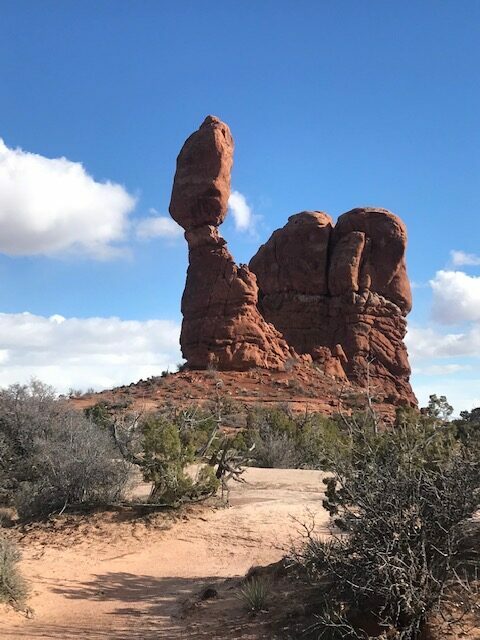 We have been in Arches National Park (#3- https://www.nps.gov/arch/index.htm) before, but still enjoyed a short, sunny sojourn into the park to appreciate the wind- and rain-carved rock formations there. 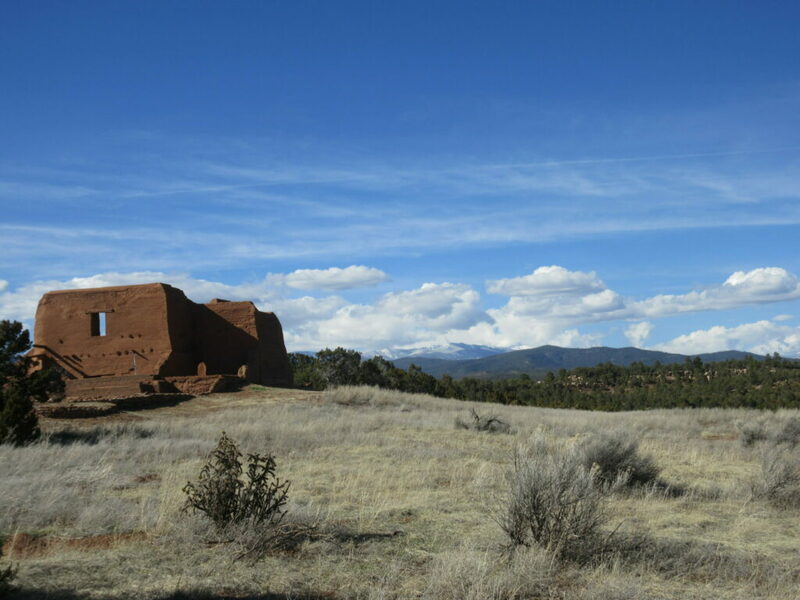 We continued through the high southwest plateau on March 15 and attempted to visit a pueblo in the “Canyon of the Ancients” National Monument in Southwestern Colorado. 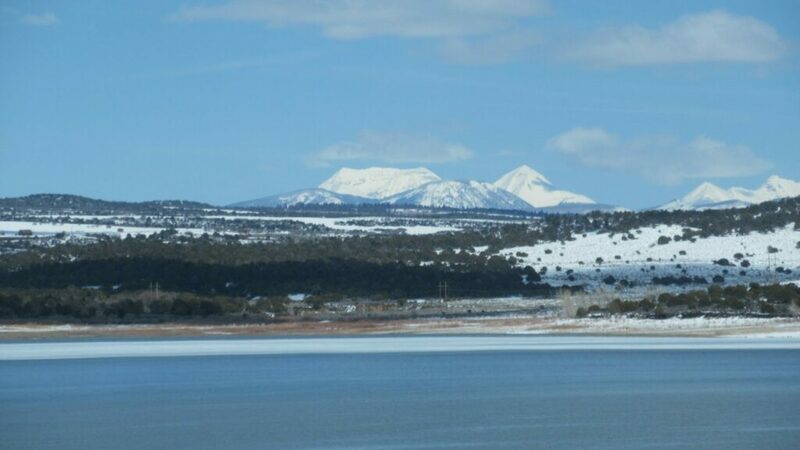 However, the 16” of snow they had received in recent days (by the “bomb cyclone”) left large patches of slush on the narrow county road to the pueblo. We had our first adventure of turning around by backing the trailer into a ranch entrance. 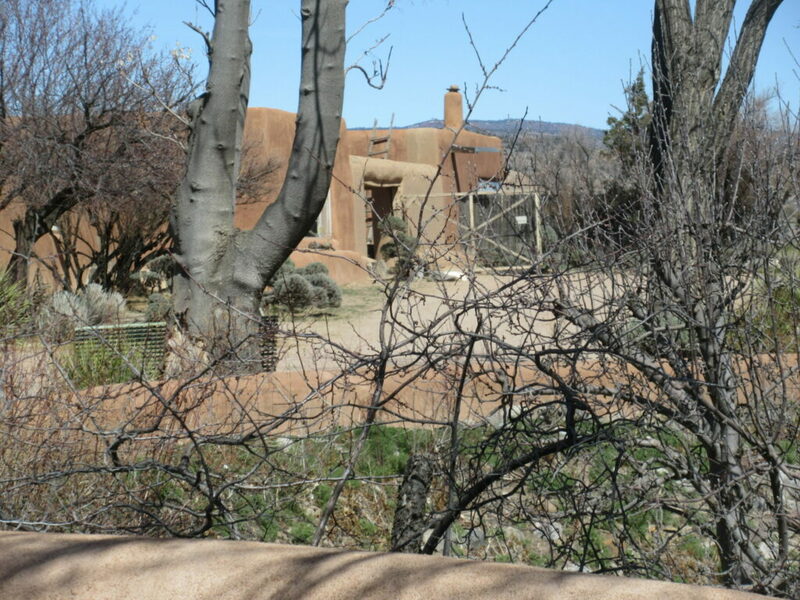 However, we were able to visit the Anasazi Visitor Center (#4- (https://www.blm.gov/programs/national-conservation-lands/colorado/canyons-of-the-ancients) that provided an interesting overview of the Anasazi culture that flourished in the area for a several thousand years before the arrival of Europeans. We had our most challenging time finding a place to stay in Colorado as most RV parks and campgrounds were closed for the season, we ended up “camped” at a mostly closed RV park (the owners in Arizona) where some accommodating permanent residents told us where we could put our trailer and we could hook up to electrical power. Low temperature overnight was 22 F.
Wonderfully scenic driving continued on March 16, as we went south from Colorado into New Mexico on a sunny, blue sky day. After crossing the Continental Divide near Chama, Utah we had lunch in the trailer in the village of Abiquiu next to one of the homes of Georgia O’Keefe (#5). We also visited a gallery there (in an old, former trading post) of an art dealer who collected pieces from all over the world including a few from Cambodia, Thailand and Vietnam. At Santa Fe we linked up with the historic Route 66 and stopped at the Pecos National Historic Park (#5-https://www.nps.gov/peco/index.htm) and spent the night at a KOA campground overlooking the hills near Las Vegas, New Mexico. Snowville, Utah, near the southern Idaho border, earned its name once again as we proceeded through blowing snow flurries that reduced visibility and dropping our speed to below 50 miles per hour from the 70 MPH limit. Fortunately, they were brief and did not result in any accumulations on the road itself. 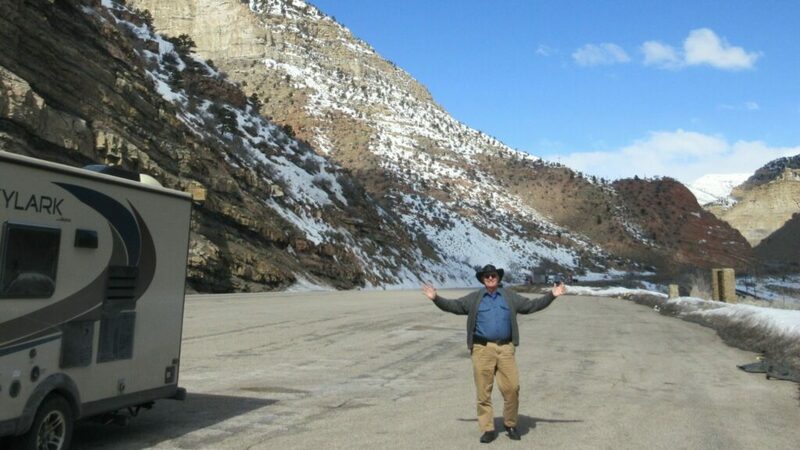 This was on Wednesday, March 13, on our way from Boise, Idaho to near Salt Lake City, Utah. 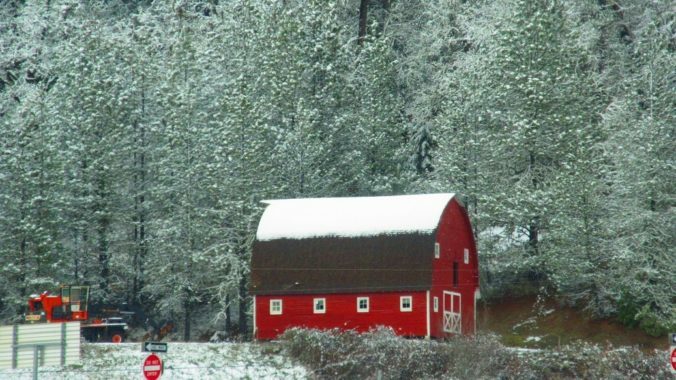 We’ve had weeks of sub-zero lows in Olympia, so we hoped after a few days to drive into spring. 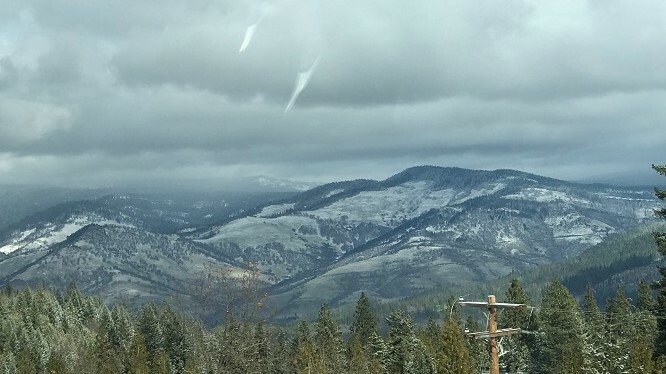 However, even our second day, from Portland to Baker City, Oregon was an unusual winter scene with snow covering the cliffs and bluffs above the Columbia River. Usually we drive that section when it is sunny and hot. But the snow accentuated the rocky cliffs and was beautiful on a sunny, blue sky day. 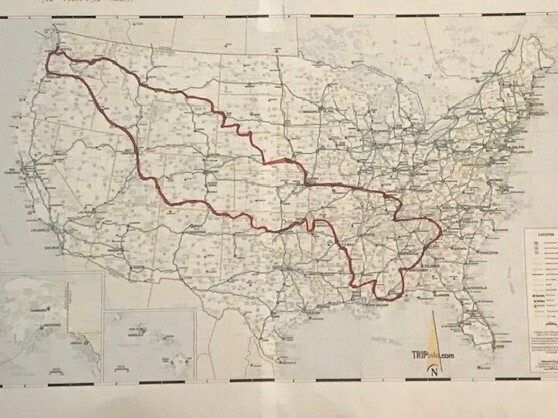 We started on our seven-week, 7400-mile, 22-state (or will it be 24?) trailer camping and cultural trip to South East US on Sunday March 10 by the short drive to Portland to have a brief visit with our grandchildren (and, OK, their parents). The short drive from Baker City, OR to Boise, ID gave us time to get some repairs done to the trailer, visit with brother Steve and his wife Lori and take our grand-nephews to dinner. 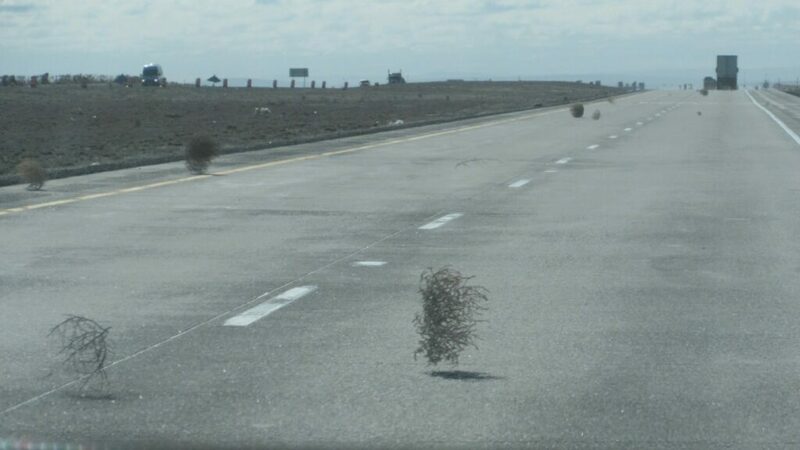 Then we were off to Utah and before the snow flurries we were dealing with strong winds that were blowing tumble-weeds across the road, like little creatures running from danger. 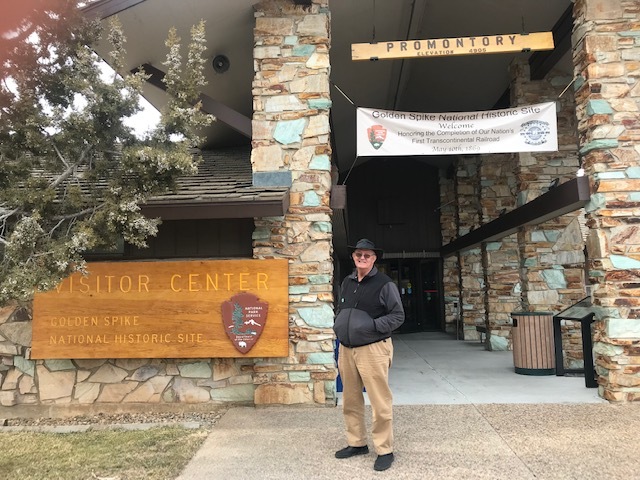 Our first “touristic” spot was at Promontory Point (point of interest #1 for this trip- https://www.nps.gov/gosp), Utah, where in 1869 the Transcontinental Railroad was completed by driving a golden spike in the rails that joined the Union Pacific from Nebraska and Central Pacific from California. We spent the night at Willard Bay State Park on the shore of Great Salt Lake, where we were greeted in the morning by a coating of snow and family of five deer wandering through the campground. With low temperatures below freezing we cannot have any water in our trailer’s fresh water tank, but have some containers in the trailer for drinking and washing up. had been cold enough overnight that the water had frozen in the pipe and hose supplying the trailer. Thankfully, no trailer plumbing was broken in the process. 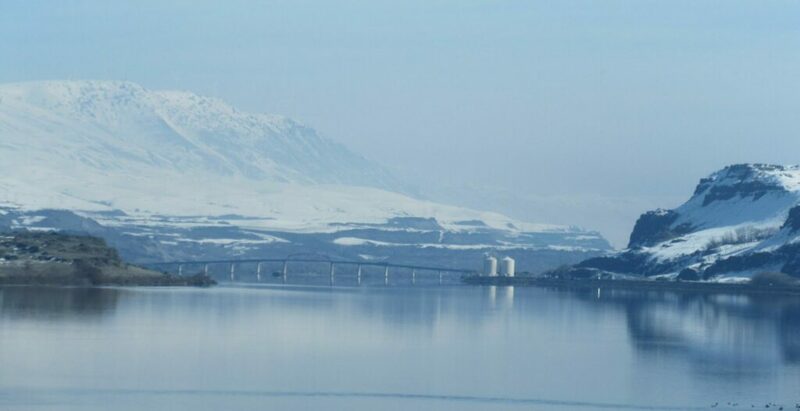 We started north on our return to Olympia and experienced snow showers interspersed with sunshine and blue skies. 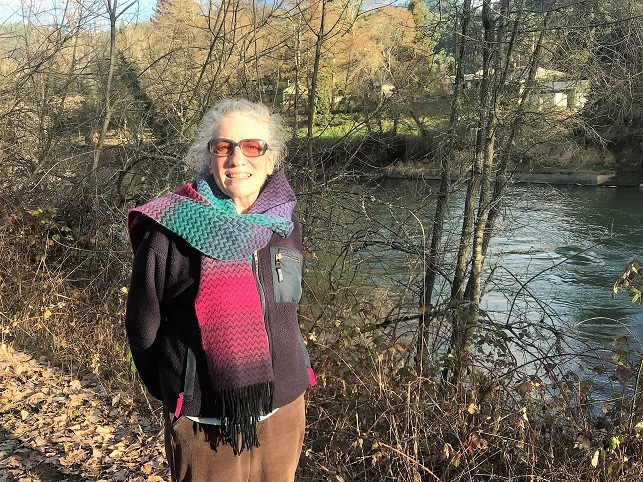 We found a nice municipal park in Myrtle Creek, OR with a few RV camp spots, and enjoyed another pre-dinner walk in the park along the Umpqua River. We were again concerned about freezing plumbing, so we left a tap dripping all night. However, the temperatures did not drop enough to freeze the nearby mud-puddles. dissuaded about the winter storm warnings predicting 2-4” of snow and difficult driving conditions. We were not planning to return until Wednesday, so we decided to check into Salem RV park and took a nap, listening to the rain (not snow, so far) on our trailer rooftop. 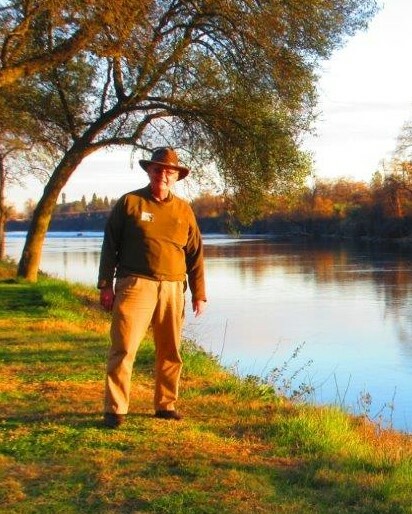 We arrived in Redding in the early afternoon (Feb.17) and stayed at an RV park along the Sacramento River. By dropping from the 4100’ elevation of Klamath Falls to 350’ of Redding we also managed to enjoy afternoon temperatures near 60 degrees. Not quite the 78 degrees of the prior week, but pleasant nevertheless, allowing us to enjoy a walk along the river, loafing in our chairs outside and decent weather to get out the grill and cook some hamburgers. Our main event the next day was to visit the Turtle Bay Exploration Park in downtown Redding by the Sacramento River. This area has been reclaimed from a gravel operation that was used to produce the 600’ tall Shasta Dam a few miles away. Now there is a botanical garden and museum and many trails leading up and down the Sacramento river. While the winter season was not optimal for enjoying the botanical garden (and we were putting up with very windy weather), we did enjoy walking a couple of miles through the garden. 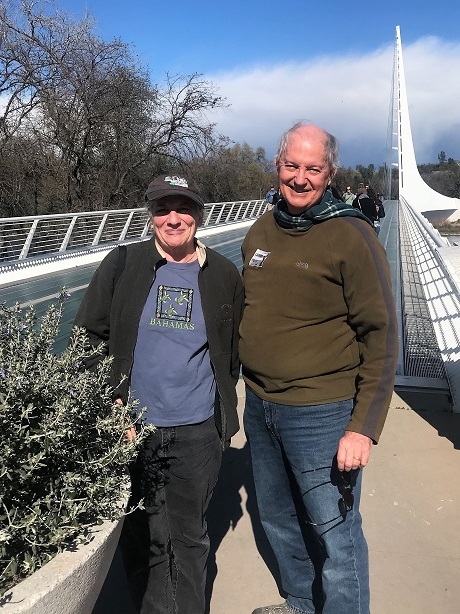 The focus of the garden was plants of a “Mediterranean climate,” similar to that of Redding, so there were areas focused on South Africa, Chile and southern Australia.A feature of the Turtle Bay park is the Sundial Bridge providing a pedestrian crossing of the Sacramento River on a glass panel, cable-stayed bridge. The tower of the bridge is oriented in such a way as to serve as a sundial, with hour markers about 20’ apart on the ground. After this excursion, we had most of the afternoon to loaf and prepare another meal grilled outdoors. On our arrival, we were able to take a hike along the Links River trail, which drains from Upper Klamath Lake to Lake Ewauna. Along this short river there are some fairly unremarkable falls which gave the name to the city. 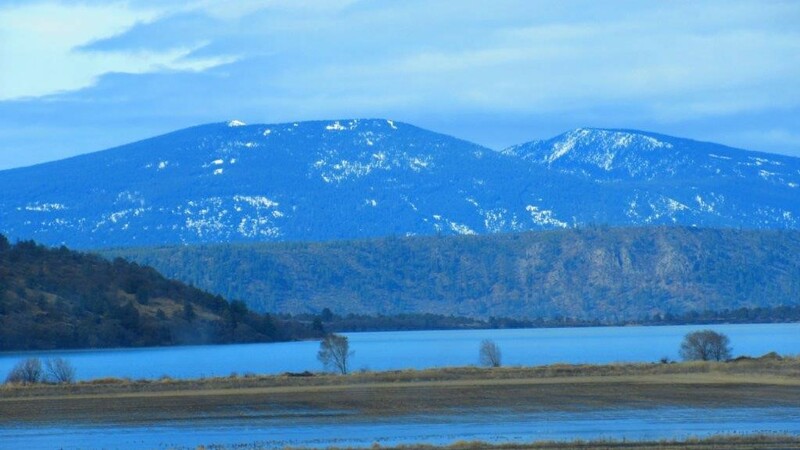 While Upper Klamath Lake is a natural lake, a canal and dam were built a 100 years ago to provide irrigation water to stretches of relatively arid land to the south. This was the one of the first reclamation projects in the United States. In the evening we attended a buffet dinner and met two other couples from Vancouver, WA and Coos Bay, OR. Then we went to a presentation on woodpeckers. On Friday we took part in a lecture/field trip about the human impacts on the Klamath Basin. There were about a dozen participants. 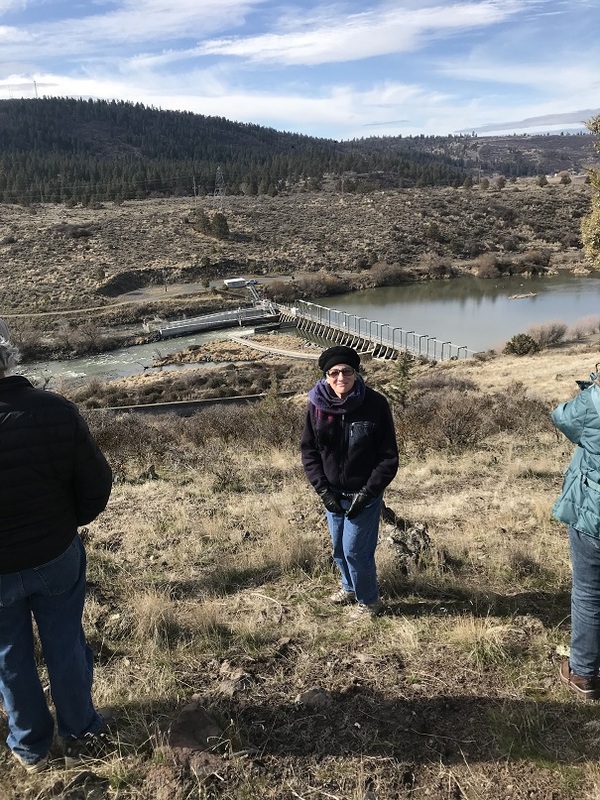 We had a one-hour slide presentation on the history of human “management” of the Klamath Basin waters, followed by trips by car to five sites to illustrate some of the main features. 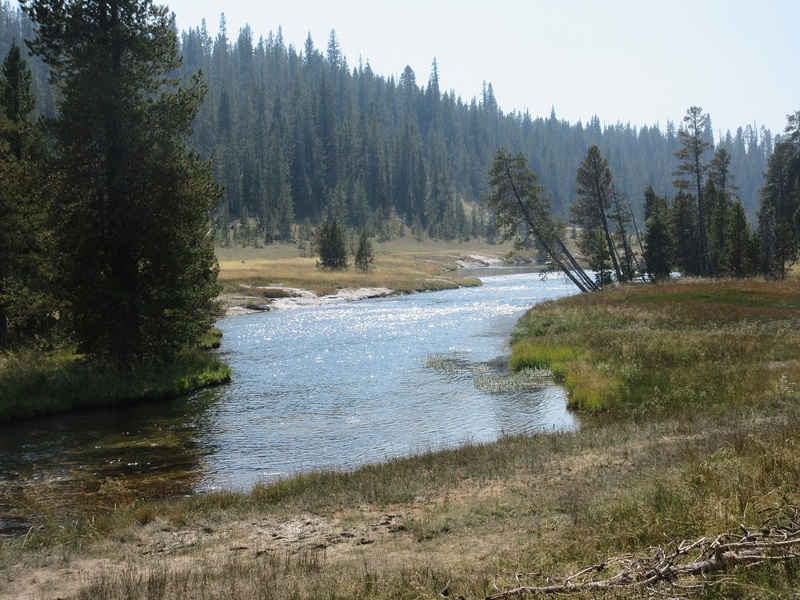 Like other parts of the west, there is contention about the potential uses of water. 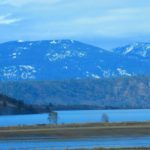 Although Upper Klamath Lake is one of the largest lakes west of the great lakes, it is very shallow and there have been years recently when water could not be supplied to the agricultural users. After our field trips, Larry enjoyed the indoor pool at the Running Y Resort and we ate at their “Ruddy Duck” restaurant. On Saturday, we headed south on U.S. 97 to Weed ,CA then on I-5 to Redding. It was another sunny day, so we had splendid views of Mt. 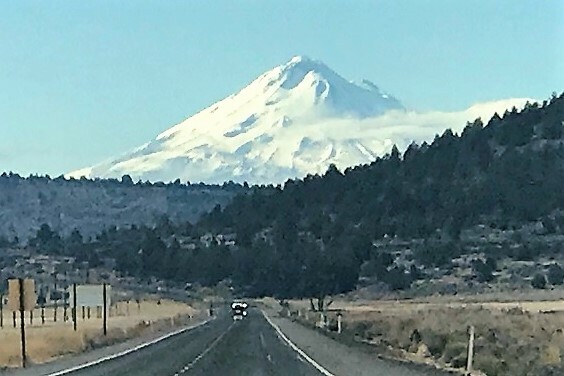 Shasta, the second highest volcano in the Cascades. Our usual February Sun break involves flying to San Diego, Palm Springs or Tucson, but with a vigorous flu season underway, we decided to avoid crowds. Cynthia discovered a “Winter Bird Festival” in Klamath Falls, Oregon, coinciding with our dates, so we decided to head there. 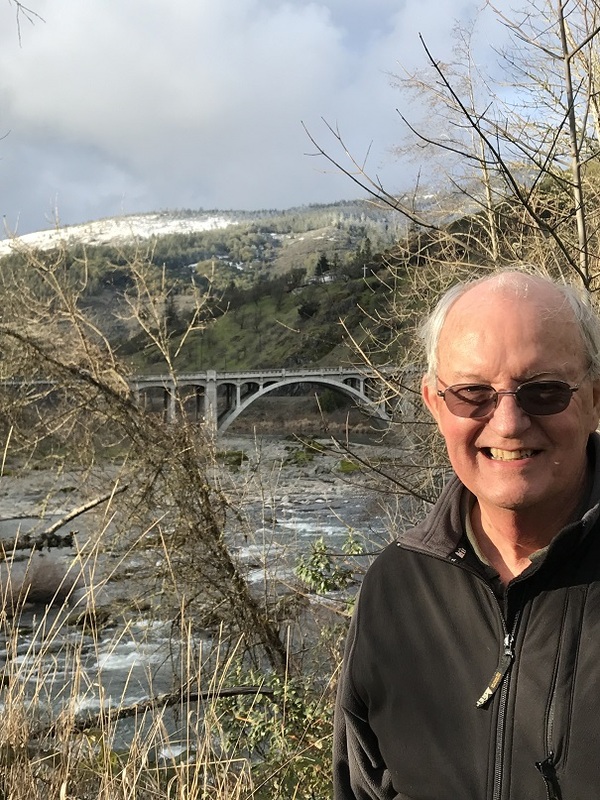 Despite growing up in Medford, 70 miles to the west, Cynthia had never been to Klamath Falls, but I had been there various times, passing through on trips from Moscow, Idaho to the Bay Area. mation on highway conditions on those routes were not better: “Severe Winter Weather” warnings on each route. So we decided to camp a the “Valley of the Rogue State Park between Grants Pass and Medford. We enjoyed a hike and actually had a valentine’s day dance to some nostalgic tunes in the Skylark. The next day we got the encouraging news that the southern route had no warnings and “bare pavement.” The weather was sunny, but as we got above 4,000’ on this narrow and windy route (OR 66), we encountered many stretches of icy or snow packed road. 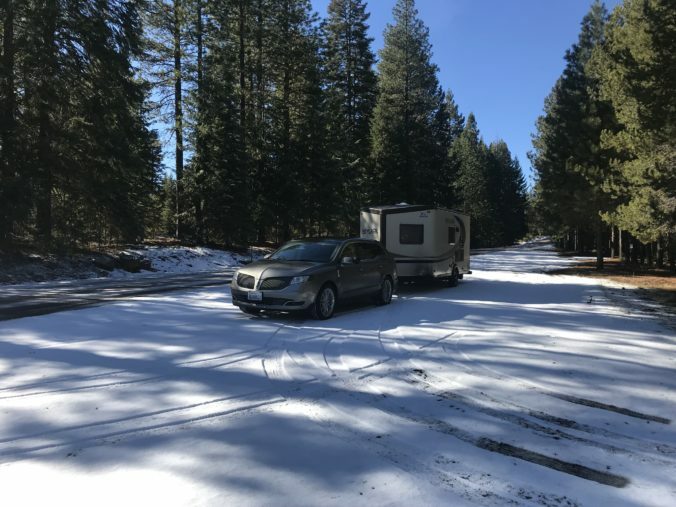 We proceeded cautiously and managed to make it to Klamath Falls by 4:00 PM on Feb. 15th. We had reservations at a nice resort, “Running Y,” so parked the trailer in their parking lot while we enjoyed the resort. 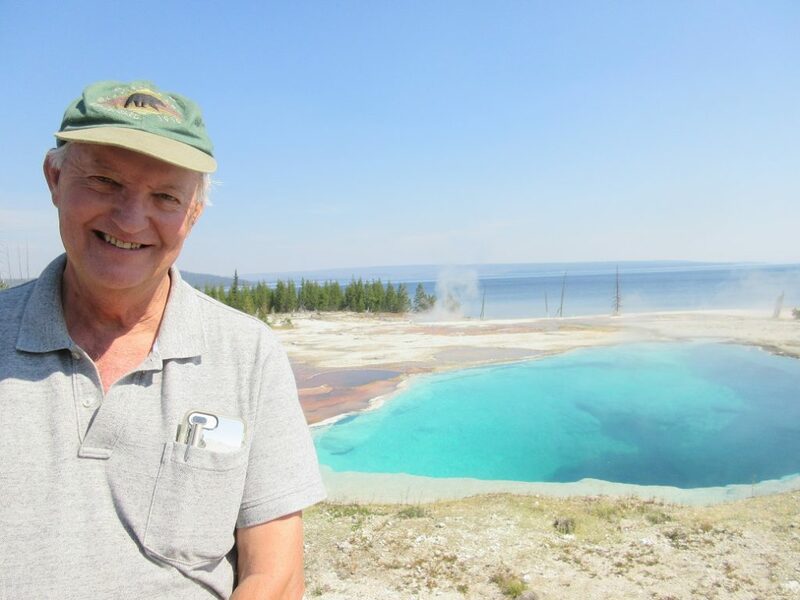 Before leaving Yellowstone, we traveled from our Madison Campground to the Norris Geyser Basin for a short walk among the thermal features there. 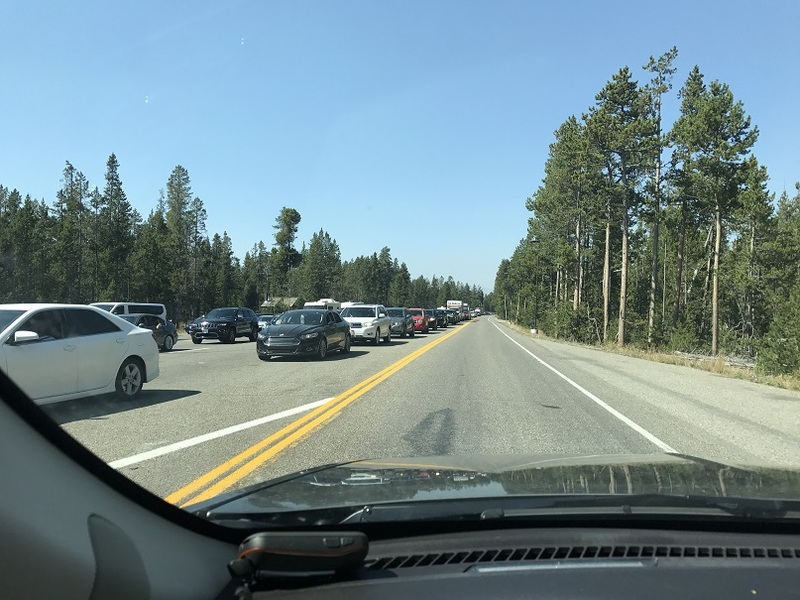 Then we exited via the West Yellowstone Entrance, where hundreds were lined up to enter the park on the Labor Day weekend. Having been along this route before we know the scenery is spectacular, but like the rest of the Northwest, it was clouded in smoky haze. On September 3, we were mostly on I-90, making tracks for home. We detoured for auto tour in nearly dead “historic” Butte and then stopped in Deer Lodge, where Cynthia visited an art gallery and a prisoner craft shop across from the “Pen” which is still mostly in a 100 year old sandstone building on main street. Meanwhile, Larry napped in 92 degree heat. We proceeded through Missoula and on to St. Regis, where, after failing to get into a Forest Service Campground on the Clark Fork river (it was full) we had our “serendipity moment” when we found an unmarked campground right on the river, which was both free and devoid of neighbors, other than fishermen in their drift boats going by. A very peaceful spot, not considering the BNSF trains that rolled by on the other side of the river every hour or so. September 4th was out longest day in terms of mileage as we went about 250 miles to the Potholes State Park south of Moses Lake. We stopped in Wallace for brunch, finding three out of four restaurants closed and plenty of parking on a “holiday dead” downtown. Everyone we met commented that the smoke was the worst that they had ever experienced. We understood that most of it was coming from Canada and Montana on unusual northeast winds. September 5th was our final day, going along the familiar I-90 to I-5 route back to our Olympia home, also still covered with smoky haze from the various regional fires. 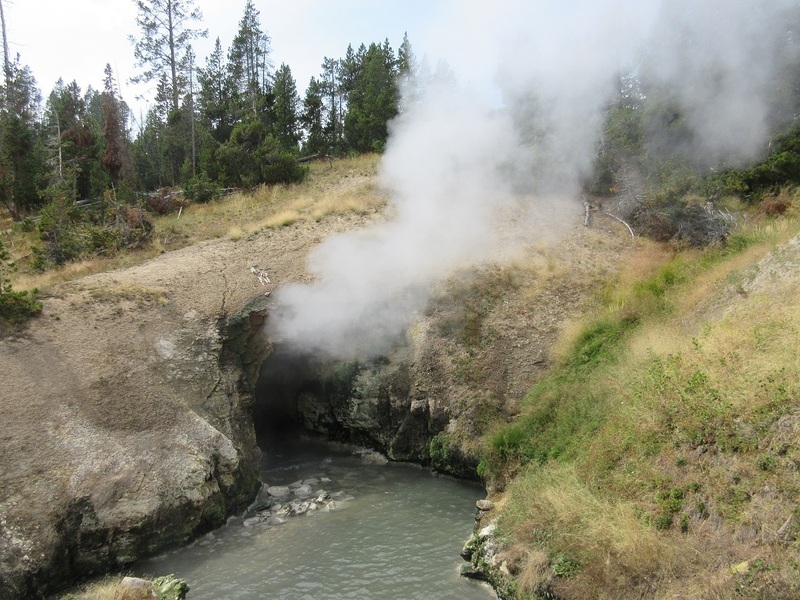 Click on the following links to see some of the videos of the thermal features we visited in Yellowstone. Fishing Bridge RV Campground near the Yellowstone River’s outlet from Yellowstone Lake. This is a rare National Park campground with full hookups, but nothing else really recommends it, as everyone is jammed together and there are no picnic tables or fire grates. After arriving we went five miles north on the Grand Loop road to the Mud Volcano area and walked around the various thermal features there. After dinner in our trailer, we went to the Lake Hotel and played backgammon with some after-dinner drinks. This was a nostalgic visit as we did the same thing during a visit in May of 1987 (we think), when our plan to camp was thwarted by snowfall. 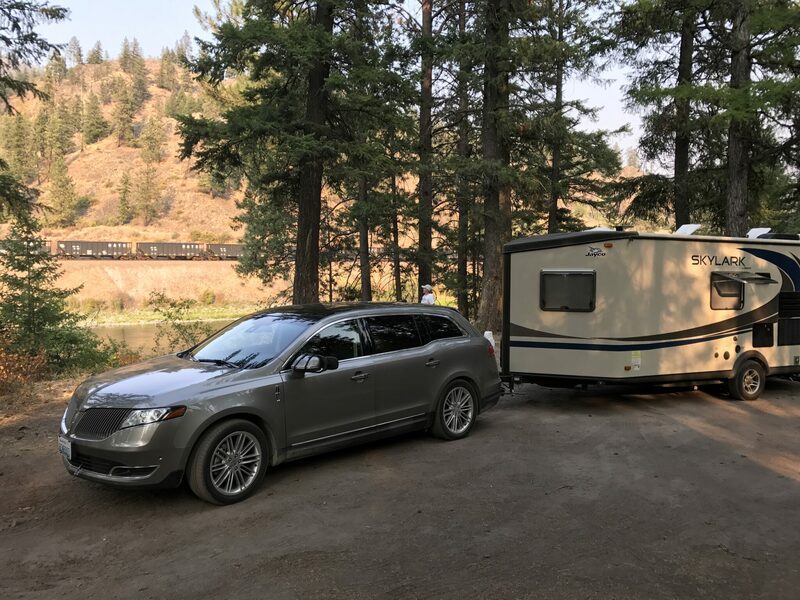 On Friday, September 1, we went around the southern part of the Grand Loop road along Yellowstone Lake and the Old Faithful Area to eventually camp at the Madison Campground in the Northwest part of the park. Enroute we stopped at the West Thumb geothermal area, which was the first time we had visited there. 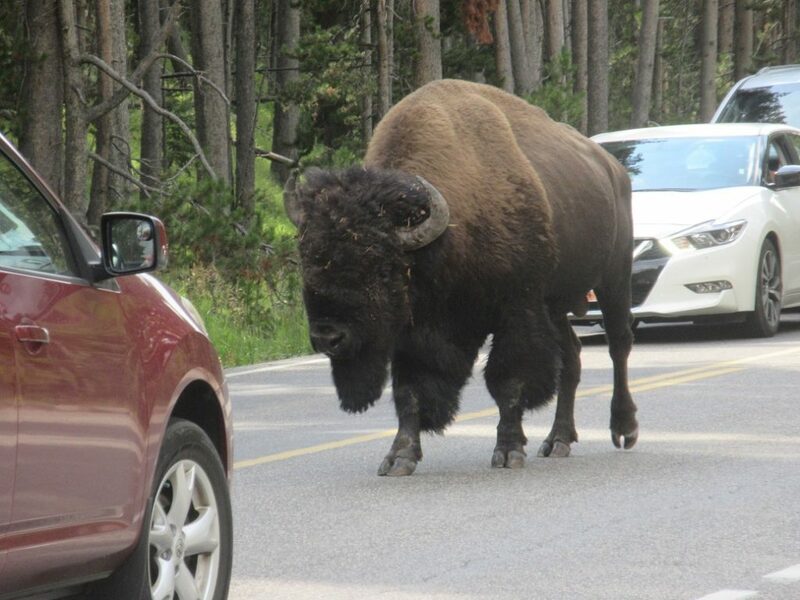 The West Thumb appears as a large bay on the west side of Yellowstone lake which was formed by a massive explosion about 150,000 years ago that created another caldera within the larger caldera of Yellostone that was formed by its massive explosion 650,000 years ago. 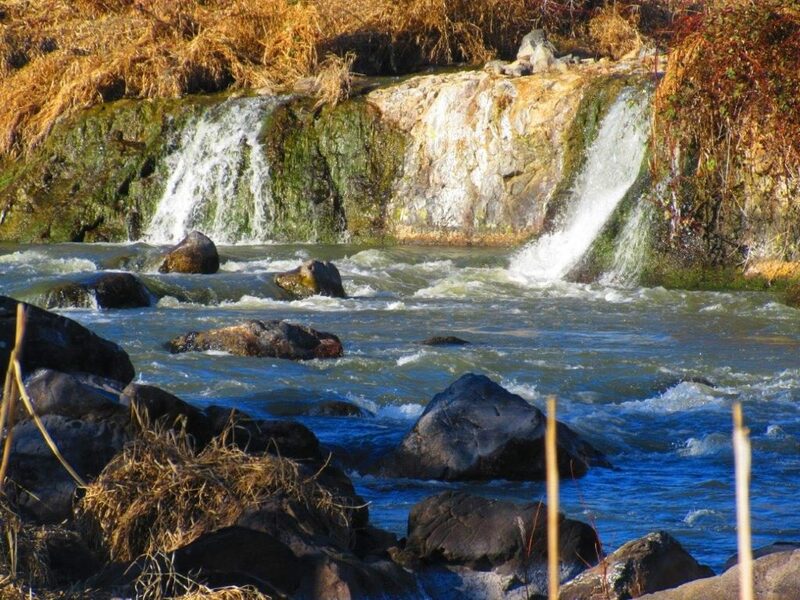 After that we stopped to take the five-mile round trip hike to Lone Star Geyser, a very pleasant trip along the Firehole river. The Lone Star geyser erupts about every three hours for about 20 minutes, but our visit was not timed right to see it. 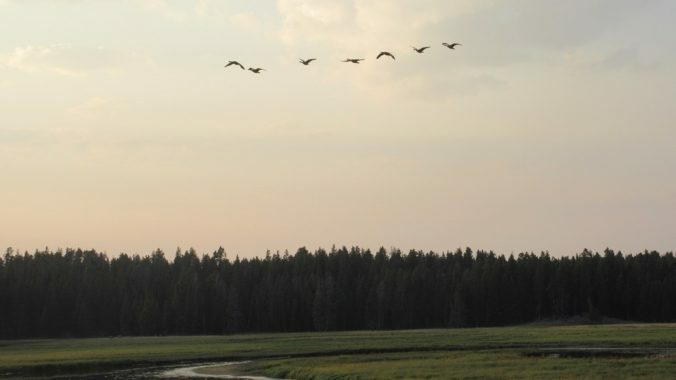 At Madison Campground we enjoyed the pleasant sunset above the tranquil Madison River. Cynthia went to the evening naturalist program, but Larry went to be bed early, with the onset of cold symptoms.